COX’S BAZAR, Bangladesh — The head of Bangladesh’s refugee commission said plans to start the repatriation of 700,000 Rohingya Muslims to Myanmar on Thursday were scrapped after officials were unable to find anyone who wanted to return. The announcement came after about 1,000 Rohingya demonstrated against returning to Myanmar, from where hundreds of thousands fled army-led violence last year. 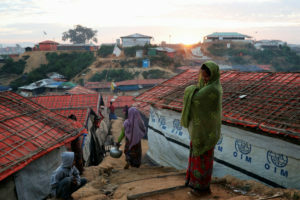 At the Unchiprang camp, one of the sprawling refugee settlements near the city of Cox’s Bazar, another Bangladeshi refugee official implored the Rohingya to return to their country over a loudspeaker. “We have arranged everything for you, we have six buses here, we have trucks, we have food. We want to offer everything to you. If you agree to go, we’ll take you to the border, to the transit camp,” he said. “We won’t go!” hundreds of voices, including children’s, chanted in reply. Bangladesh authorities had attempted to begin the repatriation of the Rohingya, despite calls from United Nations officials and human rights groups to hold off. According to a U.N.-brokered deal with Bangladesh and Myanmar, the Rohingya cannot be forced to repatriate. The countries had planned to send an initial group of 2,251 back from mid-November at a rate of 150 per day. The huge exodus of Rohingya began in August last year after Myanmar security forces launched a brutal crackdown following attacks by an insurgent group on guard posts. The scale, organization and ferocity of the operation led to accusations from the international community, including the U.N., of ethnic cleansing and genocide. Most people in Buddhist-majority Myanmar do not accept that the Rohingya Muslims are a native ethnic group, viewing them as “Bengalis” who entered illegally from Bangladesh, even though generations of Rohingya have lived in Myanmar. Nearly all have been denied citizenship since 1982, as well as access to education and hospitals. Despite assurances from Myanmar, human rights activists said Thursday the conditions were not yet safe for Rohingya refugees to go back. “Nothing the Myanmar government has said or done suggests that the Rohingya will be safe upon return,” Human Rights Watch refugee rights director Bill Frelick said in a statement. The group said 150 people from 30 families were to be transferred to a transit camp on Thursday, but the camp was empty except for security guards. Bangladesh authorities have said they’ve worked with the U.N. refugee agency to compile lists of people willing to return to Myanmar. At the Jamtoli refugee camp, 25-year-old Setara said she and her two children, age 4 and 7, were on a repatriation list, but her parents were not. She said she had never asked to return to Myanmar, and that she had sent her children to a school run by aid workers Thursday morning as usual. She said that other refugees whose names have appeared on the Bangladesh government’s repatriation list had fled to other camps, hoping to disappear amid the crowded lanes of refugees, aid workers and Bangladeshi soldiers. Negotiations for repatriation have been continuing for months, but plans last January to begin sending refugees back to Myanmar’s Rakhine state were called off amid concerns among aid workers and Rohingya that their return would be met with violence. Foreign leaders, including U.S. Vice President Mike Pence, have criticized Myanmar’s Nobel Peace Prize-winning leader Aung San Suu Kyi this week on the sidelines of a summit of the Association of Southeast Asian Nations in Singapore for her handling of the Rohingya crisis. But on Thursday, Pence said that U.S. officials were “encouraged to hear that” the repatriation process would begin. In addition to those who arrived in Bangladesh last year, about 200,000 other Rohingya had fled Myanmar during previous waves of violence and persecution. Associated Press reporters Annabelle Liang and Samuel McNeil in Singapore contributed to this report.